The leggings are projected to sell out in a couple of weeks. IT'S no secret activewear is big business. Companies like Lorna Jane, Lululemon and PE Nation have made a motza selling stretchy pants and crop tops to gym bunnies all over the country. As any activewear aficionado will tell you, cloaking your toned limbs in these brands can become an expensive pursuit - a pair of Lorna Jane leggings will set you back about $100 while Pip Edwards' PE Nation label goes up to $169 for a pair. Those lofty prices may explain why people have been flocking to a new $25 pair of leggings from Target. The retail chain's design team has been blown away by the popularity of this particular item, which comes in two designs: floral shard and frozen. The leggings in 'floral shard' design. "Our active campaign launched on TV with the commercial airing nationally on August 5", says Karen Brickell, head of design for Target womenswear. In the 10 days since they landed in stores they've sold 6500 pairs of the floral shard print. The same style legging in the frozen print has also sold a whopping 5000 units. They project that they will sell out in the next 2-3 weeks. The leggings in the 'frozen' print. The full length, mid rise leggings feature a wide waistband for better tummy control and comfort, good pocket storage (side pocket and back zip pocket) and flatlock seams to help stop chaffing. They are made from stretchy moisture-wicking fabric to help keep you dry as you work out. On Target Australia's Facebook page, Claire McCowan writes "I have bought the black and rainbow tights as well as the peach coloured top to match. I have done a HIIT class in both sets of tights and I'm so impressed they were squat proof (checked them in change room to see if they went see through lol) did not sag at crotch and were very comfy. "I did go a size smaller than usual, but fit was great and great price. "Thanks Target ps the price is great as many of the top brands are so expensive". Coral Reynolds was also a fan, writing "I wore the floral patterned leggings for a half marathon on Sunday and they were so comfortable". The Target leggings were shown at a fashion event in Sydney. Head of design Karen Brickell is blown away by the customer's response to the new item. "Our leggings are as bold, modern and striking as any other pair you might find in a specialty retailer - but the best part is they're so affordable at just $25," says Brickell. "Every woman in Australia should be able to have fashionable, quality products that don't cost the earth. Plus, these leggings make every woman look and feel amazing". Despite the fact that women are loving the design, the relatively low cost begs the question: will they last? "Our product has all the quality credentials you'd expect in a high performing legging - the fabric has been thoroughly tested and meets shrinkage and stretch and recovery industry standards," says Brickell. "The leggings are made up of 14 per cent elastane to assist in better comfort, fit and performance, with a heavier hand (feel) to help hold you in. Flat lock seams mean much stronger stitching for more arduous workouts." 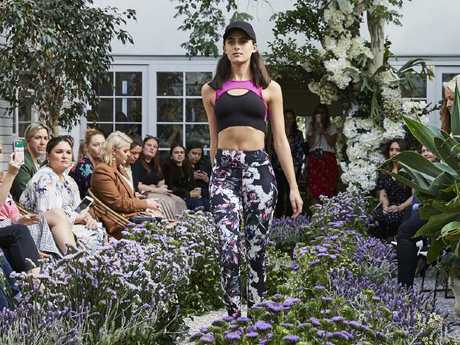 Fashion media preview the new range of activewear. The other potential issue with a fashion bargain like this is that the item is ethically and sustainably dubious. Images of sweat shops and environmentally rotten practices tend to creep in. The 2018 Ethical Fashion Report by Baptist World Aid gave Target a score of B in this year's rankings. Worryingly, they scored a D+ for "worker empowerment" which doesn't paint the situation in their overseas factories in a particularly positive light. A Target spokeswoman told news.com.au the store is trying to improve this score. "Target is committed to improving the working conditions of people who are employed in our suppliers' factories and while we have made progress, this space is forever evolving and we are always looking for ways to improve," she said in a statement. Models show off Target's new activewear range. "We continue to support worker empowerment through partnering with industry groups such as ACT (Action, Collaboration, Transformation) and by being a signatory of the Bangladesh Accord," she said. "Through our own ethical sourcing code that suppliers must adhere to, we conduct regular audits in our supplier factories and work closely with them to ensure they meet the requirements to provide all workers a safe working environment, as well as providing a grievance hotline for all factory workers."